"In My Place" is a song by the British alternative rock band Coldplay. The song was written collaboratively by all the band members for their second album, A Rush of Blood to the Head. The track is built around thumping drums and chiming guitars. It was released on 5 August 2002 as the lead single from A Rush of Blood to the Head and reached number two on the UK Singles Chart. The song also reached number 17 on Billboard's Modern Rock Tracks. "In My Place" was well received by critics, who complimented its arrangement and profound lyrics. The song won the award for Best Rock Performance by a Duo or Group with Vocal at the 45th Grammy Awards. "In My Place" builds around a three-note guitar lines and thumping drums. In an interview with Q magazine, lead singer Chris Martin stated that "In My Place" was a song Coldplay had left after recording their debut album Parachutes (2000). When the band finished recording their second album A Rush of Blood to the Head, Martin said that the album was complete. However, after guitarist Jonny Buckland played the song on his guitar, Martin said that they now needed to record it and include it on the album. Martin also said that: "That's about where you're put in the world, and how you're given your position, and the way you look, and how you have to get on with it." In an interview, Buckland revealed that the song was hard to record, as the band had played the song live. He also commented that when they started recording the song, they did not know how it should sound, due to the band members' contrasting ideas. The song opens with a single crash cymbal followed by two bars of 4/4 drumming, then a plaintive three-note guitar line rings through a strummy rhythm, and Martin's vocals. Its instrumentation is varied with the sound of thumping drums, chiming guitars, a singalong chorus, and a string arrangement. The song also features a guitar lick swirl. The three lines of the third verse allude to a man's love of a woman, who does not reciprocate his love. He is saying he will always wait for her, but he does not think that she should stay where she is any longer. The lyrics emphasize: "But I wait for you/if you go, if you go/leaving me here on my own/well I wait for you." The song's lyrics also include references to a desire for weary optimism. Coldplay's performance of "In My Place" during the band's Viva la Vida Tour. Critics were positive towards the song. In the Entertainment Weekly review of the album, critic David Browne wrote: "Songs like 'In My Place' and 'Warning Sign' marry lyrics imbued with deep regret and mistakes (''...You were an island / And I passed you by'' in the touching latter song) with lyrical melodies and guitar hooks that twinkle and sparkle." Adrien Begrand of PopMatters wrote: "When the shimmering, pretty lead-off single 'In My Place' represents the album's weakest moment, you know you've got something extraordinary. Currently storming the charts a la 'Yellow', 'In My Place' is another surprisingly simple song, carried by Jonny Buckland's chiming guitar and Chris Martin’s heartfelt vocals. It really shouldn't amount to much, but Coldplay make it work very well. When Martin sings, "Please, please, please/Come back and sing to me," he totally sells it, and you buy it. And why not? The song's lovely. Amy M. Bruce of The Towerlight wrote: "With a slew of introspective rock songs like 'In My Place' and 'God Put a Smile upon Your Face,' this album is worthy of the hype surrounding the band's first album." Jules Willis of the BBC wrote: "The second track, the first written post-Parachutes and sounding like a refugee from that album, is the grower 'In My Place'. It's a fantastic pop tune that justifies Coldplay's status as one of UK's most exciting bands." Coldplay released "In My Place" in the US and UK on 5 August 2002 as the album's lead single. The single was pressed with two B-sides: "One I Love" and "I Bloom Blaum". The single cover features Buckland, with art directed by Sølve Sundsbø. "In My Place" peaked at number two on UK Singles Chart on 17 August 2002, kept off the top by "Colourblind" by Darius Danesh. It stayed in the chart until 23 November 2002. The song reached number seventeen on Billboard's Hot Modern Rock Tracks in 2002. The band were yet to have a number one single. In 2005, "Speed of Sound", the lead single of the band's third album, X&Y, also reached number two, but never the number one position. "Speed of Sound" was marked as Coldplay's most successful single until "Viva la Vida", reached number one in 2008. A live recording of "In My Place" from Glastonbury Festival 2011 was released to download on 26 June 2011. The music video for "In My Place" was directed by Sophie Muller. It debuted on 17 June 2002 on AOL. It features a by-the-numbers band performance, in which Coldplay are playing in a huge, nearly empty room. The two women in the background were members of the video crew: a makeup artist/wardrobe assistant and the video commissioner. 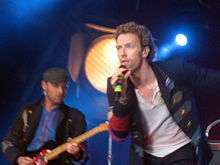 The video starts off with band playing; while they play, Chris Martin, who is sitting in a corner, gets up and joins them in the song. During the video, Martin sings directly to the camera. During the guitar solo, Martin runs up to the two women in the background, talks to them for a while, and then returns to sing the rest of the song. The video concludes with the band finishing the song. The video was subjected to a spoof by Bad Lip Reading on their YouTube page. It was dubbed with the song "Yeti" that was composed and recorded, like BLR's other videos, to humorously reinterpret the lip movement and action in the video. "Yeti" has received well over a million views on YouTube. "In My Place" won a Grammy Award in the category of Best Rock Performance by a Duo or Group with Vocal at the 2003 Grammy Awards. The song was nominated for two MuchMusic Video Awards for Best international video–group and People's Choice: Favorite international group. In 2003, "In My Place" was featured on Coldplay's live album, Live 2003. In 2012, "In My Place" was featured on Coldplay's live album Live 2012. The song appeared in the 2006 episode "Saving Sammy" on CBS' television series Cold Case. The song was used as a closing montage song about a case from 2003. The track appeared again on an episode of the television series Fastlane. The song is also featured in as playable in Guitar Hero 5. In 2010 the song was on the cbs show Ghost Whisperer. Most notably, the song was also featured in the hit WB (now CW) show Smallville in the second season premiere. All versions of the official single included the B-side, "One I Love". This track was regularly performed on the subsequent A Rush of Blood to the Head Tour and is also featured on the Coldplay Live 2003 DVD. 1 2 3 "The State of Coldplay". Q. August 2002. ↑ Klein, Joshua (5 August 2002). "Coldplay set for stardom with blend of talent, fun". Chicago Tribune: 3. ↑ "Coldplay Ezine: Issue 6" (PDF). Coldplay.com. Archived from the original (PDF) on 8 April 2008. Retrieved 31 August 2008. 1 2 3 "Coldplay Ezine: Issue 4" (PDF). Coldplay.com. Archived from the original (PDF) on 11 November 2007. Retrieved 31 August 2008. 1 2 3 4 Wiederhorn, Jon (12 August 2002). "Single Saves Coldplay". MTV News. Retrieved 2 September 2008. 1 2 Parker, Nigel (23 August 2002). "Coldplay's Rush is near-flawless". BBC News. BBC. Retrieved 29 April 2009. ↑ Cheal, David (12 October 2006). "Perfect Playlist: Coldplay". The Daily Telegraph: 030. ↑ McNamee, Paul (30 July 2002). "Coldplay — In My Place". NME. Retrieved 2 September 2008. ↑ Denning, Adrian. "Coldplay album reviews". Adrian Denning.com. Retrieved 1 September 2008. ↑ "In My Place Lyrics". MTV. Retrieved 2 September 2008. ↑ McCormick, Neil (1 August 2002). "Why I'm suddenly warming to Coldplay". The Daily Telegraph. London. Retrieved 2 September 2008. ↑ Browne, David (2 September 2002). "A Rush of Blood to the Head — Music Review". Entertainment Weekly. Retrieved 2 September 2008. ↑ Begrand, Adrien (6 September 2002). "Coldplay: A Rush of Blood to the Head". PopMatters. Retrieved 2 September 2008. ↑ Bruce, Amy M. (2 September 2002). "Coldplay is not "Yellow" anymore". The Towerlight. ↑ Willis, Jules (20 November 2002). "Coldplay — A Rush of Blood to the Head". BBC Music. BBC. Retrieved 2 September 2008. ↑ "Coldplay Ezine: Issue 3" (PDF). Coldplay.com. Archived from the original (PDF) on 11 November 2007. Retrieved 2 September 2008. ↑ Wiederhorn, Jon (3 September 2003). "Coldplay To Release Live DVD, CD". MTV News. Retrieved 3 September 2008. 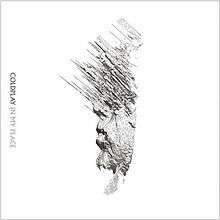 ↑ "In My Place (B-Sides) by Coldplay". Yahoo! Music. Retrieved 2 September 2008. ↑ "Coldplay Ezine: Issue 5" (PDF). Coldplay.com. Archived from the original (PDF) on 11 November 2007. Retrieved 2 September 2008. ↑ Sexton, Paul (23 June 2008). "Coldplay Dominates U.K. Album, Singles Charts". Billboard. Retrieved 2 September 2008. ↑ "Darius Danesh Remains Atop UK Singles Chart". Pop Dirt. 12 August 2002. Retrieved 2 September 2008. ↑ Jones, Alan (17 August 2002). "The official UK singles chart top 75.". Music Week. Retrieved 2 September 2008. ↑ "Artist Chart History — Coldplay". Billboard. Archived from the original on 5 April 2013. Retrieved 2 September 2008. 1 2 "Week Ending June 28, 2008". Yahoo! Music Blogs. 28 June 2008. Retrieved 2 September 2008. ↑ "Coldplay top US Billboard chart". BBC News. BBC. 19 June 2008. Retrieved 10 February 2009. ↑ "Coldplay Give "Blood"". Rolling Stone. 14 June 2002. Retrieved 4 September 2008. ↑ Bad Lip Reading (July 2012). Yeti (Spoof). ↑ "The 2003 Grammys: Main winners". BBC News. BBC. 23 February 2003. Retrieved 2 September 2008. ↑ "Complete list of Grammy winners". Associated Press. CNN: Showbiz/Music. 24 February 2003. Archived from the original on 23 May 2008. Retrieved 2 September 2008. ↑ Jeckell, Barry A. (21 May 2003). "Our Lady Peace Leads Muchmusic Video Nominees". Billboard. All Business. Retrieved 10 February 2009. ↑ Snodgrass, Michael (12 November 2003). "Coldplay Becomes Our Friend And Buys Us Ice Cream". The Buffalo News: N4. 1 2 Tyler Bensinger and Paris Barclay (2006-10-22). "Saving Sammy". Cold Case. Season 4. Episode 74. 45 minutes in. CBS. ↑ Kim Newton and Paris Barclay (2002-09-25). "Girls Own Juice". Fastlane. Season 1. Episode 2. 60 minutes in. Fox. ↑ "Activision Unveils Epic 85 Song Guitar Hero(R) 5 Set List Featuring Widest Variety of Today's...". Forbes. PR Newswire. 30 July 2009. Retrieved 16 October 2009. ↑ Live 2003 (DVD). Capitol Records and Parlophone. 2003. ↑ "Australian-charts.com – Coldplay – In My Place". ARIA Top 50 Singles. ↑ "Ultratop.be – Coldplay – In My Place" (in Dutch). Ultratip. ↑ "Ultratop.be – Coldplay – In My Place" (in French). Ultratip. ↑ "Danishcharts.com – Coldplay – In My Place". Tracklisten. ↑ "Coldplay: In My Place" (in Finnish). Musiikkituottajat – IFPI Finland. ↑ "Lescharts.com – Coldplay – In My Place" (in French). Les classement single. ↑ "The Irish Charts – Search Results – In My Place". Irish Singles Chart. ↑ "Italiancharts.com – Coldplay – In My Place". Top Digital Download. ↑ "Dutchcharts.nl – Coldplay – In My Place" (in Dutch). Single Top 100. ↑ "Charts.org.nz – Coldplay – In My Place". Top 40 Singles. ↑ "Norwegiancharts.com – Coldplay – In My Place". VG-lista. ↑ "Archive Chart: 2002-08-11". Scottish Singles Top 40. ↑ "Spanishcharts.com – Coldplay – In My Place" Canciones Top 50. ↑ "Swedishcharts.com – Coldplay – In My Place". Singles Top 100. ↑ "Swisscharts.com – Coldplay – In My Place". Swiss Singles Chart. ↑ "Archive Chart: 2002-08-11" UK Singles Chart. ↑ "Coldplay – Chart history" Billboard Bubbling Under Hot 100 for Coldplay. ↑ "2002 UK Year-end Charts" (PDF). UKChartsPlus (PDF). Retrieved 28 December 2015.